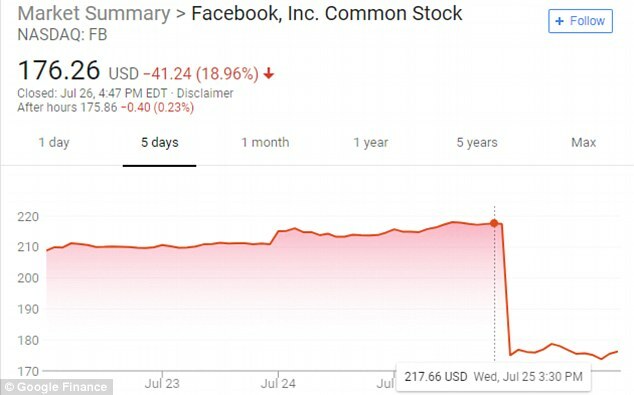 Facebook has had the worst day in stock market history as shares plunged 19 percent, wiping $119 billion off the company’s value. 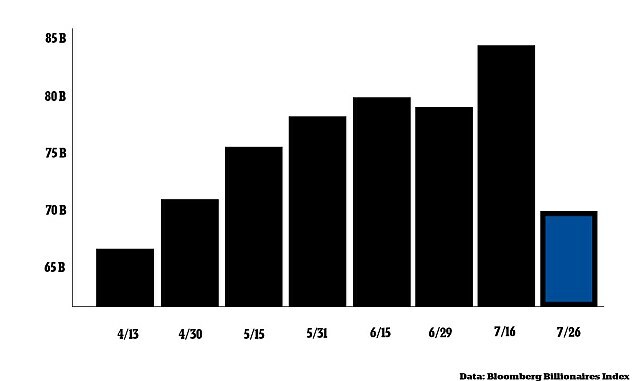 Thursday was the social media giant’s worst day in six years as a public company, as well as the biggest one-day wipeout in US stock market history. CEO Mark Zuckerberg saw $12 billion wiped off his fortune in less than 24 hours. The Facebook founder’s net worth is now valued at $74 billion, dropping him to the fifth richest person in the world. Facebook’s shares plunged $41.24 to $176.26 after it failed to meet Wall Street’s estimates for user growth and quarterly revenue. Eight Facebook insiders have sold a combined total of $3.9 billion worth of stock since the social media site was plagued by the Cambridge Analytica scandal. The sales were part of pre-determined trading plans, according to Bloomberg. Zuckerberg accounted for about 90 percent of total sales, which were part of a pre-determined plan he announced last September. The Facebook CEO and his wife Priscilla Chan pledged they would sell most of their shares over time so that they could invest in charities. Brian Wieser, an analyst at Pivotal Research, has been recommending to sell Facebook stocks since last year. He predicts the social media giant’s shares still have another 20 percent to fall. 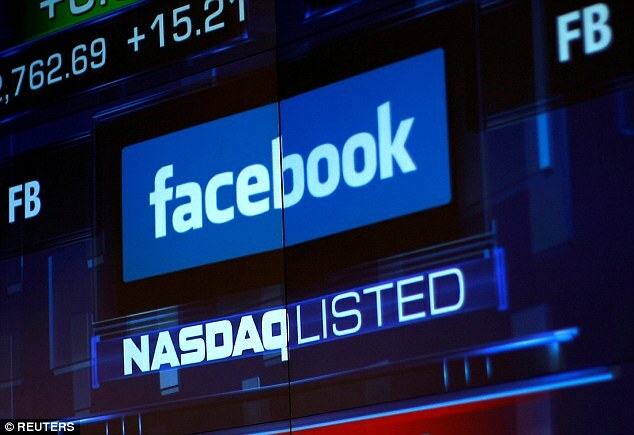 Wieser’s street-low price target – his prediction of where stocks will move within the next year – is at $140, compared to the $174.78 low Facebook hit during early Thursday trading. The share price eventually closed in $176.26, but Wieser believes Facebook’s days of 30 percent growth are now outnumbered. Investors hammered shares in the social media giant after it reported slower revenue growth in the second quarter after markets closed on Wednesday. The results fell short of Wall Street expectations as the company continues to grapple with privacy issues. Subsequently, in overnight trading, the company’s shares plunged 20 per cent, a figure that was then reflected when markets opened Thursday morning. Facebook’s second-quarter results were the first sign that new European privacy laws and a string of privacy scandals involving Cambridge Analytica and other app developers are hitting the company’s business. But the company still has a total market value close to $511 billion, which exceeds the annual gross domestic product of countries like Poland, Belgium and Iran. The $15.8 billion in net worth that Zuckerberg stands to lose in the move is equal to the wealth of the world’s 81st-richest person, currently Japanese businessman Takemitsu Takizaki, according to Forbes real time data. Describing the announcements as ‘bombshells’, Baird analysts said the issues were to a large degree ‘self-inflicted’. Facebook executives made investors nervous on Wednesday in a call with analysts when they said profit margins would plummet for several years due to the costs of improving privacy safeguards and slowing usage in its biggest advertising markets. Chief financial officer David Wehner warned in the earnings call that revenue growth had already ‘decelerated’ in the second quarter and would drop ‘by high single digit percentages’ in coming quarters. Ad sales in Facebook’s second quarter rose 42 percent to $13.04 billion but the costs, bolstered by moves to improve content and security after the data scandal, rose 50 percent from a year earlier to $7.37 billion. Facebook’s monthly active user count was 2.23 billion, slightly behind the 2.25 billion forecast by analysts. Users in Europe dropped from 377 million to 376 million, partly as a result of the new General Data Protection Regulation (GDPR) rules. World stock markets failed to hold onto four-month highs on Thursday as a record sell-off in Facebook shares offset optimism that the European Union and the United States would settle their differences on trade. Executives warned that profits would continue to plummet as the company improves privacy safeguards. That countered optimism over news that President Donald Trump agreed to refrain from imposing car tariffs while Europe and the US negotiated to cut other trade barriers. The Dow Jones Industrial Average rose 112.97 points, or 0.44 percent, to 25,527.07, the S&P 500 Index lost 8.63 points, or 0.30 percent, to 2,837.44 and the Nasdaq Composite dropped 80.05 points, or 1.01 percent, to 7,852.19. Liz Young, senior investment strategist at BNY Mellon Investment Management, said investors’ skepticism of the market is leading them to take a closer look at corporate earnings and other fundamental factors ‘rather than jumping on the bandwagon and investing in tech stocks’. ‘People need to be careful right now to be in those trendy trades,’ she said. Yet the heat has eased somewhat over US and European trade issues, allowing markets to return their attention to central banks and their plans to withdraw stimulus. The euro, which initially received the US-EU trade news warmly, fell sharply after European Central Bank boss Mario Draghi reaffirmed a commitment to keep interest rates on hold ‘through’ next summer, even though he saw inflation picking up by the end of the year. Concerns about Facebook’s major earnings miss in an otherwise largely positive US corporate results season did little to support bonds, which lost value as yields resumed their climb higher ahead of an expected strong reading on US gross domestic product data on Friday. Progress on trade also helped demand for oil, which is sensitive to economic growth prospects. Crude prices also rose as Saudi Arabia suspended oil shipments through a strait in the Red Sea after an attack by Yemen’s Iran-aligned Houthi movement. US crude settled 0.45 percent higher at $69.61 per barrel and Brent rose 0.83 percent to $74.54. The plunging share prices follows months of criticism leveled against the social media giant over its handling of several recent scandals, including the Cambridge Analytica data saga and Russian meddling in the US election. The Cambridge Analytica scandal prompted several apologies from Zuckerberg and generated calls for users to desert Facebook, which has grown strongly since launching as a public company in 2012. According to analysts, stalling numbers are likely the result of forcing Facebook users to consciously opt-in to having their information used for personal advertising – one of the key stipulations of the stringent GDPR rules. 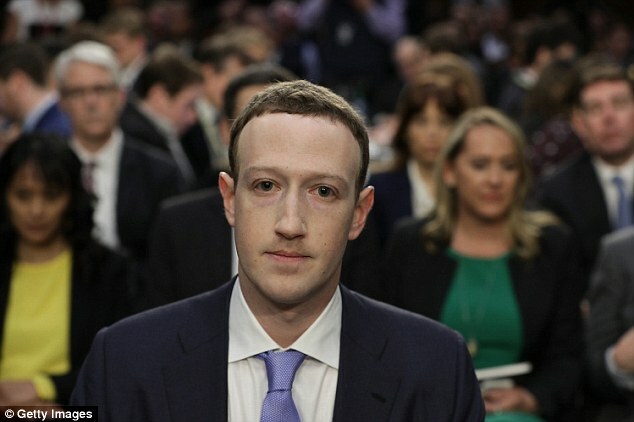 It comes after shareholders tried to fire Zuckerberg as chairman of Facebook in a proposal filed on Wednesday by Investment company Trillium Asset Management. The company, who has about $11 million in Facebook stock, wants to break up Zuckerberg’s role as both chairman and CEO, Business Insider reports. The investment company says this oversight has contributed to Facebook ‘missing or mishandling’ several ‘severe controversies’ in past years, which they say increases risk exposure and costs to shareholders. The specific examples the shareholders used include: Russian meddling in US election, the sharing of 87 million users’ personal data with Cambridge Analytica, proliferating fake news and social unrest in Myanmar and Sri Lanka. Chances of Zuckerberg’s roles being split remain slim given Facebook has rejected similar shareholder requests in the past. A proposal last year to oust Zuckerberg as chairman received 51 percent of the votes. Meanwhile, in addition to the financial woes, a promotional event for Facebook’s new video feature descended into a shouting match on Wednesday, as reporters quizzed the social media giant’s executives about its decision to allow Fox News and Infowars on the platform. Facebook will be featuring Fox News alongside other news organizations on Watch, while right-wing conspiracy theory site Infowars has a Facebook page that is followed by nearly a million people. The debate at the Television Critics Association’s press tour in Beverly Hills began when Facebook’s head of video was asked why Facebook still hosted Infowars when it peddled conspiracy theories including calling the Sandy Hook massacre a hoax. Daily active users (DAUs) – DAUs were 1.47 billion on average for June 2018, an increase of 11% year-over-year. 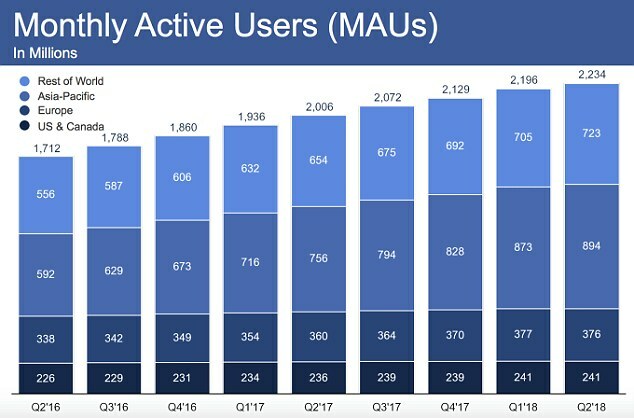 Monthly active users (MAUs) – MAUs were 2.23 billion as of June 30, 2018, an increase of 11% year-over-year. Mobile advertising revenue – Mobile advertising revenue represented approximately 91% of advertising revenue for the second quarter of 2018, up from approximately 87% of advertising revenue in the second quarter of 2017. Capital expenditures – Capital expenditures for the second quarter of 2018 were $3.46 billion. Cash and cash equivalents and marketable securities – Cash and cash equivalents and marketable securities were $42.31 billion at the end of the second quarter of 2018. Headcount – Headcount was 30,275 as of June 30, 2018, an increase of 47% year-over-year. Fidji Simo replied that although he found Infowars ‘absolutely atrocious’, Facebook’s approach to freedom of expression meant the company would only reduce the distribution of Infowars posts, rather than ban it completely. Zuckerberg was also being called on to remove hateful and harassing comments from the social media platform that have been posted by conspiracy theorists who don’t believe the Sandy Hook Elementary School shooting happened. 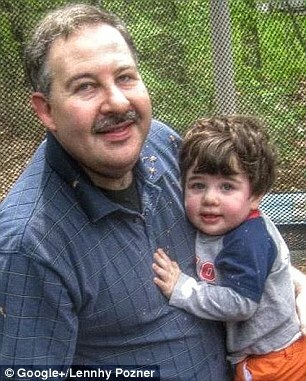 Leonard Pozner and Veronique De La Rosa, the grieving parents of one of the 20 children killed in the 2012 Newtown shooting massacre, wrote Zuckerberg a letter published on Wednesday in The Guardian. 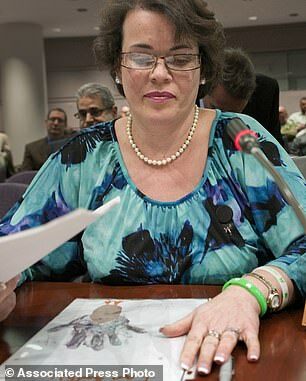 Pozner and De La Rosa say they and other relatives of mass shooting victims have been harassed and threatened on social media and in person by people who claim the shootings were government hoaxes and the victims – including their son Noah – were actors. ‘Our families are in danger as a direct result of the hundreds of thousands of people who see and believe the lies and hate speech, which you have decided should be protected,’ they wrote. Zuckerberg raised eyebrows in an interview with Recode last week when he said he finds denial of the Holocaust ‘deeply offensive’ but doesn’t believe such content should be banned from Facebook. He also said in the interview that the claim the Sandy Hook shooting didn’t happen is false. ‘I also think that going to someone who is a victim of Sandy Hook and telling them, ‘Hey, no, you’re a liar’ – that is harassment, and we actually will take that down,’ Zuckerberg said.